Near dusk on January 6th I stationed myself at a high place along Lost Horizon Dr. with a good view of the sky, hoping the sunset might be pleasant. As I took the cloud picture above, I noticed that a bird had flown into the frame at the lower right. With no time to change to better settings on the camera, all I could do was pan to follow the bird, which fortunately got closer. Three seconds after the first photograph (thanks, metadata) I took the second, whose dark subject seems to my non-avian-attuned eyes to be a vulture. Vultures are necessary and many predators eat carrion when necessary. I’ve enjoyed many Arizona sunsets from high, cirrocumulus clouds. Vultures play a role in the ecosystem, no question. For a photographer, however, approaching vultures and their carrion from downwind is sometimes not enjoyable, as I can attest from my most recent ground encounter. 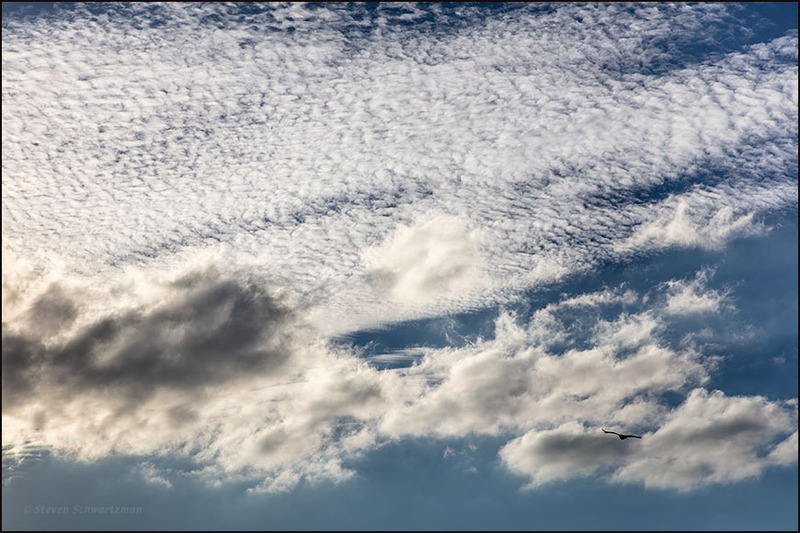 The high cirrocumulus clouds attracted me. They ended up not turning colors as the sun set but I still enjoyed them in mostly monochrome. Can I apply that to both? Isn’t it fun when beautiful creatures wander (soar?) into your landscape pan? It was exciting to follow the vulture, even if only for three seconds. The second picture turned out better than I thought it would. I’d have preferred a shutter speed faster than 1/400, but for lack of time to plan, I ended up with a pan. We will see many of those birds in IA when warm weather returns. They re graceful fliers. That’s surprising, isn’t it, given how large they are and how ungainly they seem on the ground. We might say these ungainly birds gain gainliness in the air. Rather like penguins in the sea. It’s wonderful how creatures that seem awkward and ungainly in one medium come into their own in another. Penguins are a good land~sea counterpart. Likewise for seals and walruses. I certainly wouldn’t pan either of these photos. Given the tendency of both our vultures to soar (I take this one to be a black vulture), a slower shutter speed can do a good job of capturing them, as your photo proves. There’s nothing fishy about your first photo, either, even though I grew up knowing those upper level clouds as a ‘mackerel sky.’ Of course there was a verse to go along with the sight, since the clouds were considered a sign of changeable weather: “Mackerel sky, mackerel sky — never long wet, never long dry.” I’m not sure how reliable they are as predictors, but it does seem they show up here more often in winter, when fronts are more common and the battle between warm and cold fronts on the coast is constant. At least the second picture wasn’t a case of “out of the frying pan, into the fire.” (Truth to tell, there was an intervening shot that wasn’t good and that I metaphorically tossed into the fire.) And you’re right that because the vulture was soaring I didn’t have to deal with moving wings, which probably would have kept me from getting any good pictures. I’ve heard of a mackerel sky but this is the first time I’ve seen the accompanying ditty. You’ve tangentially reminded me that the modern French version of the word from which English acquired mackerel, maquereau, is slang for ‘a pimp.’ The things one learns from studying French…. Why that fish got singled out for the “honor” I have no idea. I just did a little research and learned that the two kinds of French maquereau are most likely unrelated words. Wonderful capture of the vulture in flight, Steve. And clouds always make me happy. Thanks, Jane. Do you look at clouds from both sides now? That must make for double happiness. Ah, my totem, the vulture! I love cool cloud shots. Very nice! I saw similar clouds some minutes earlier on the way home. By the time I got my camera and went back out, the appealing clouds I’d seen were gone, but these were a good substitute. Clouds are always favorites of mine, and that is a very nice shot of that vulture. Nice shots, Steve! Thanks, Lavinia. I’ve long been fond of making cloud pictures, sometimes as part of a landscape but also in their own right, as here. The vulture came as an unanticipated bonus. Our Turkey Vultures migrate so they are absent at the moment. Maybe some are hanging out over Austin. I can usually find a few in a local field when they are in the midst of their spring return. Yours looks good against that nice mackerel sky. The map at https://www.allaboutbirds.org/guide/Turkey_Vulture/maps-range shows turkey vultures in Austin all year, and the map at https://www.allaboutbirds.org/guide/Black_Vulture/maps-range shows the black vulture here all year long as well. Both maps also show what you said, that the species are absent from Massachusetts in the winter. Now if only some of the mackerel clouds had started to decay, the vulture could have had at them. I love these unexpected surprises, Steve. 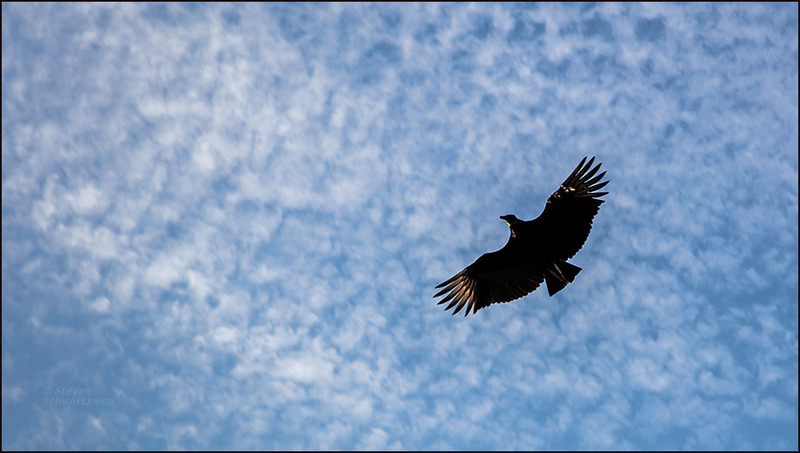 Nice capture of the vulture, in front of a gorgeous sky. A surprise it was, and a pleasant one. The moment when I took the first picture was just right for me to spot the vulture and follow it for a few seconds. I could easily have missed it. The clouds were a much easier subject. I’ll have more about them in a follow-up post. https://www.allaboutbirds.org/guide/Black_Vulture/maps-range shows that the black vulture never even gets close to Oregon. I’ve been a cloud fan for a long time too.